Zeezok Publishing's Z-Guide to Jason and the Argonauts is a great way to incorporate media into your study of Greek mythology. Follow Jason and his motley collection of Greek heroes on their quest to obtain the Golden Fleece. This guide contains a topic overview movie synopsis and ten learning activities. Several of these activities focus on developing the students creative writing abilities and critical thinking skills. A hands-on art project crossword puzzle and Worldview Activity rounds out the individual assignments while the entire family can participate with the For Family Discussion questions. Choose those activities which best fit your students course objectives areas of interest or time schedule. With the Jason and the Argonauts movie guie anyone can vicariously relive the epic moments of ancient Greece. Note: movie and popcorn are not included. Movie Summary: Jason wants to rid Thessely of Peliass tyrannical rule. With the goddess Heras help Jason embarks on a voyage to obtain the Golden Fleece from the far-off country of Colchis. Along the way the Argonauts battle the statue of Talos free Phineas from the tormenting Harpies and with divine assistance from Mount Olympus safely navigate the Clashing Rocks. Aided by the beautiful Medea the brave Greeks overcome the Hydra and the skeleton soldiers to escape with the magical fleece. 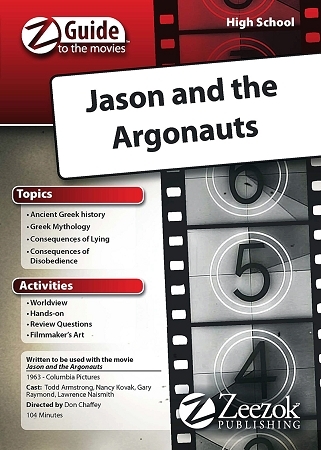 This Z-Guide is based on the movie Jason and the Argonauts (1963). You can view a trailer for the movie below.